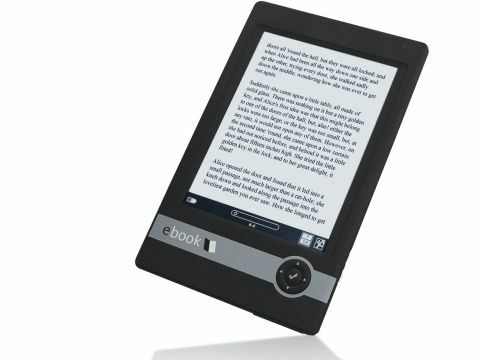 Can Elonex and Borders sew up the UK ebook market before Amazon arrives? Ebooks have been 'the next big thing' for over a decade now. By teaming up with Borders to put its eBook reader in bookshops at £180, Elonex is hoping to finally crack the mainstream market in the UK – but is the eBook the right device to do it? It's certainly very portable; even with a 6" screen and an SD slot, the eBook is much smaller (8mm thick) and lighter (180g) than the Sony and iRex iLiad ereaders (or the Kindle). The e-ink screen is clear and easy to read, inside or out and at almost any angle. And e-ink gives you phenomenal battery life compared to an LCD screen; Elonex says 8,000 page turns (it's only turning the page that uses power) for a full charge and we read for several hours without seeing any change in the battery status. But e-ink has drawbacks too. As with all e-ink readers, 'turning' the page means refreshing the screen, which means resetting all the e-ink cells to black and then redrawing the, causing the screen to flash a reverse white on black image of the page momentarily. You may find this disconcerting and distracting. With image-heavy PDFs, like presentations, we often saw artefacts from previous pages on screen (so the graphics from one page would appear ghosted on the blank background of the next slide) and page turn can be slow - over 5 seconds to load the next page in a PDF presentation and 4 seconds for a PDF ebook. Text and HTML pages take about 3 seconds but books in ePub format load and turn the page much more quickly. Again we occasionally saw the remains of the menu on the page after we'd opened and closed it.